Green Home Farm, a vegetable smallholding in Co Galway, contacted us after seeing the work we had done for Good and Green in Killaloe. They wanted a similar concept developed in WordPress. 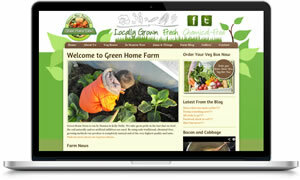 They also wanted a new logo which reflected their “earthly” produce and, because of the number of competing veg box suppliers in the Galway region, they needed the site to be search engine optimised to rank well for geographic terms such as “veg box galway”, “veg boxes co galway” and “veg box delivery galway”.